XZ1, accountant for the Men in Black Project, accused the Bolingbrook Village Board of incompetence after reviewing their $90 million dollar budget. Unnamed sources say that the Bolingbrook Budget submitted by Mayor Claar and the Board did not even try to hide the expenses for Clow UFO Base, and included an unauthorized 20 percent increase in the alien abduction tax. "Why didn't you just go to the top of the Sears Tower and scream 'Bolingbrook has a UFO base?'" XZ1 is alleged to have said. The board countered that no one had bothered to read the budget in 20 years. In fact, they were surprised when Citizens for a Better Bolingbrook asked to see the budget. "That's why you hide the expenses in the line items." Countered XZ1. "Former Ed Rosenthal managed to disguise a ground to space laser system expense as wallpaper for his bathroom. You guys could learn a lot from him!" The Village Board the budget at the 4/28/09 meeting without releasing the full details. Claar promised to have a cleared version of the budget at his home. Any who wants to see the budget will be escorted by the Men in Blue to Claar's home. XZ1 also approved the increase in the abduction tax. The Bolingbrook Village Board passed an ordinance at the 4/28/09 meeting that some say is a declaration of war against outdoors dust. "Roger is really adamant about this." Said Steve, a source close to Mayor Roger Claar. "He said, 'Steve, we're in a recession. That's means more dust on things. Now I don't give a damn about indoor dust right now, but outdoor dust looks bad. It makes the village look bad, and it makes me look bad. If there's too much dust, that stupid web site will post pictures of it, and then people will vote me out of office. Then Bolingbrook will really suffer! So we must stop dust before it destroys Bolingbrook!'" Claar did not speak with the Babbler about this ordinance, but during the meeting, he explained that the ordinance is designed to create more green space, and prevent blockage of rain runoff. The village attorney added that all current homes are exempt. 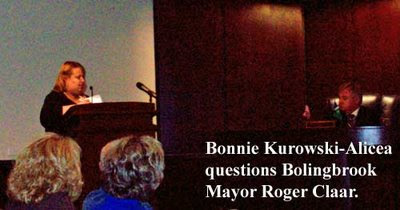 Before the 4/28/09 Bolingbrook Village Board Meeting, The Roger Claar Party declared former mayoral candidate Bonnie Kurowski-Alicea "The Anti-Roger." "Just as Jesus is opposed by the Anti-Christ, Mayor Roger Claar is opposed by the Anti-Roger." Said David Nelson, founder of the party. "Bonnie seeks to destroy all that Roger has built. Also, do we really know how she survived her car crash? Was it a miracle, or was it something else?" Nelson urged all Bolingbrook residents to pray for Claar and to donate to his campaign fund. "God provides strength in the struggle against darkness, but He doesn't provide cash. Are you willing to provide a few dollars to help Roger fight the darkness that is Bonnie?" Claar is not a member of The Roger Claar party, and has worked to keep them off the ballot. After the board meeting, Kurowski-Alicea refused to comment, saying that, "I have serious work to do for the people of Bolingbrook." Then a man holding a smart phone walked up to this reporter. He faced the departing audience and said. "Yes, Bonnie has serious work to do for the people of Bolingbrook. We have serious work to do for Bolingbrook. You're either for us or you're against---" The man then looked down at his screen, and pushed some buttons. He looked up and said, "us. If you're against us, then you're with Roger. If you're with Roger, then you support corruption. If you support corruption, then you are EVIL!" A group of Internet users say they are prepared to post mean and incendiary posts on web sites they deem "anti-Roger." "We are ready to attack the strongholds of cowards who attack Roger Claar." Said General Bush, a former member of the 101st Keyboard Brigade. "This is civil war, and we are prepared to fight. According to Bush, among the sites they plan on "trolling" include Chicago Magazine, The Sun-Times, and Fox News. These sites, they say, only print bad news about Roger. For the site Citizens for a Better Bolingbrook, the group plans a special attack. "First we're going to concern troll them for weeks. We'll even throw in some good advice, just to confuse them. Then we'll hit them with the really hard flames. Most of the members will be so confused and hurt that they’ll shut up." Bush says once they get the signal from Claar, they will launch the attack. When asked after the 4/28/09 board meeting about the group, Claar replied, "Trolling? I have never played Dungeons and Dragons, nor have I asked others to play D and D on my behalf, since I moved to Bolingbrook."